It was an early start to get to Moorside Academy in Skelmersdale. The morning started with an assembly in the hall. Year 2 through to Year 6 joined the session and in a fast-paced forty minutes I managed to explain how the books are made. 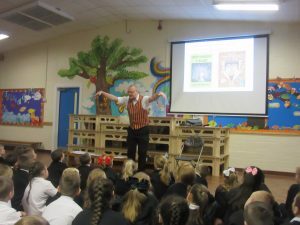 I even made time to put on the storytelling waistcoat to share one of the Tales. It was a fab session! After catching my breath I joined Year 5 for a writing session. The children were challenged to recreate an alternative ending to one of my stories. After explaining my thought process behind the existing text, the pupils picked out any vocabulary or description they wanted to ‘magpie’. Lots of discussion followed and the children made a start on planning their ending. I hot-footed it to Year 6 and repeated the session. It proved as energetic and exciting as the Year 5 workshop – ideas were whizzing around the room. I left the children deep in their planning process and can’t wait to read some of the final writes. This was my second visit of the academic year and it was a joy to return. Thanks must go to Miss Dorrington for organising the morning and the book signing at lunchtime. There was talk of a third visit later in the year – everything crossed it happens!